In stock -This product will ship today if ordered within the next 2 hours and 28 minutes. 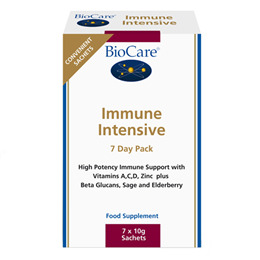 A potent complex of elderberry, sage and beta glucans with vitamin C, vitamin D and Zinc which support a healthy immune system in a convenient and pleasant tasting powder that can be mixed with liquids for flexibility. A single convenient sachet dose with a great taste and easy to mix into liquids. Zinc supports the integrity of the respiratory tract and contributes to a normal function of the immune system. Vitamin C contributes to the normal function of the immune system and the integrity of mucous membranes. It also protects cells from oxidative stress. Vitamin A and vitamin D contribute to the normal function of the immune system. Corn Maltodextrin, Vitamin C (as Magnesium Ascorbate), Potato Maltodextrin, L-Lysine Hydrochloride, Honey, Elderberry Extract (Sambucus nigra Fruit), Sage (Salvia officinalis Leaf), Cellulose, Raspberry (Rubus idaeus Fruit), Blackcurrant Extract (Ribes nigrum Fruit), Bilberry Extract (Vaccinium myrtillus Berry), Blackberry Extract (Rubus fruticosus Fruit), Blueberry Extract (Vaccinium sp. Berry), Strawberry (Fragaria ananassa Fruit), Beta Glucans, Zinc Citrate, Citric Acid, Modified Corn Starch, Corn Dextrin, Sunflower Oil, Antioxidants (Ascorbyl Palmitate, DL-Alpha Tocopherol & Sodium Ascorbate), Vitamin A (as Retinyl Acetate), Sucrose, Vitamin D3 (as Cholecalciferol). Do not take if you are pregnant, or likely to become pregnant, except on the advice of a doctor or antenatal clinic. 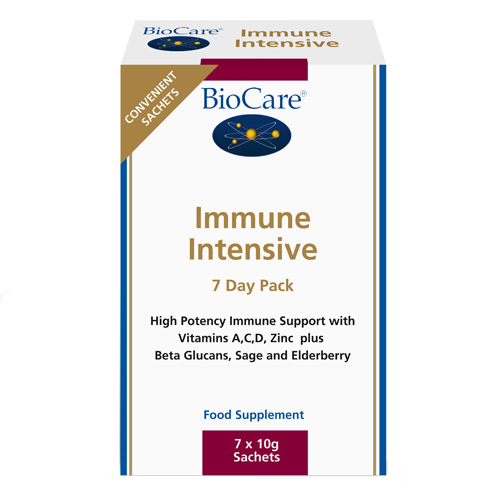 Below are reviews of Immune Intensive - 7 Day Pack - 7 x 10g Sachets by bodykind customers. If you have tried this product we'd love to hear what you think so please leave a review. I love it. 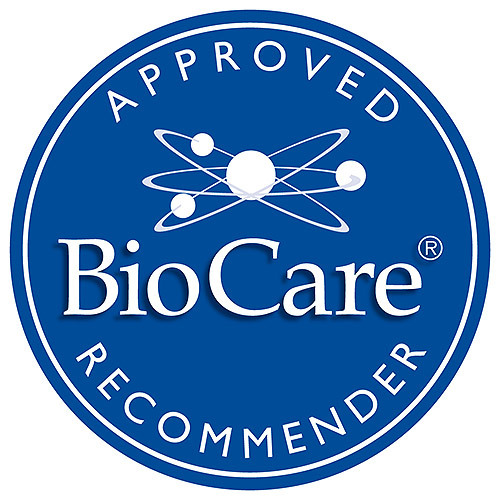 I have been taking this as my favorite immune boost from Biocare. Higlhy recommended. A great-tasting powder to support the immune system.